Something borrowed, something new: Guy Shockey shares some tricks on fitting a borrowed backplate to make sure your straps and D-rings are in the right place. Instructor Trainer Guy Shockey goes over how to fit your backplate. He also shares some tricks on how you can use the H’s on Halcyon webbing to make sure your D-rings are in the correct spot. If you can touch the top of the plate, you can reach your valves. Make sure the plate is squared to your back. Fold the webbing over and pull up. Make sure the H’s are equidistant from the center grommet hole. Count the H’s to match adjustment of straps and D-rings. Want more tips and tricks? Watch more here. 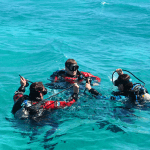 Guy Shockey is a GUE instructor and trainer who is actively involved in mentoring the next generation of GUE divers. 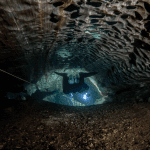 He started diving in 1982 in a cold mountain lake in Alberta, Canada. Since then he has logged somewhere close to 8,000 dives in most of the oceans of the world. 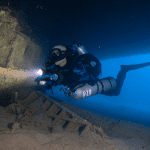 He is a passionate technical diver with a particular interest in deeper ocean wreck diving. He is a former military officer and professional hunter with a bachelor’s and master’s degree in political science, as well as an entrepreneur with several successful startup companies to his credit.